ECFA is an accreditation agency that enhances trust in Christ-centered churches and ministries by establishing and applying Seven Standards of Responsible Stewardship™ to accredited organizations. Founded in 1979, ECFA provides accreditation to leading Christian nonprofit organizations that faithfully demonstrate compliance with established standards for financial accountability, transparency, fundraising, and board governance. The Christ-centered ministries accredited by ECFA include churches, denominations, educational institutions, rescue missions, camps, and many other types of tax-exempt 501(c)(3) organizations. Collectively, these organizations represent over $26 billion in annual revenue. 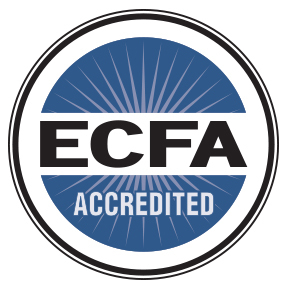 ECFA accreditation entitles a ministry to use the ECFA seal and receive benefits such as enhanced fiscal credibility, recognition by the secular nonprofit community, and affirmation of integrity for donors. The continuing use of the seal depends on the ministry’s good faith compliance with all ECFA Standards. These Standards of Responsible Stewardship focus on board governance, financial transparency, integrity in fund-raising, and proper use of charity resources.